After campaigning on repealing the Affordable Care Act, and voting to repeal the ACA over 50 times during the Obama Administration, Republicans could not close the deal when they had the chance to actually do it. What gives? That doesn’t mean the Obamacare repeal effort is dead forever. As Sarah Kliff writes, it won’t truly die so long as Republicans control Congress. The GOP could try again next year, or the year after. But the path gets harder from here. The midterm election gets closer. A new bill would have to clear the House all over again, as well as the Senate. And Republicans still haven’t solved their central problem on health care: They don’t have an idea that they, or the public, actually likes. On Twitter, congressional reporter Steven Dennis noted that Obamacare has had far more than its allotted nine lives. It’s survived the unexpected election of Sen. Scott Brown, two Supreme Court challenges, the 2012 election, Sen. Ted Cruz’s government shutdown, the HealthCare.gov debacle, the House’s American Health Care Act alternative, the Senate’s Better Care Reconciliation Act alternative, the “skinny repeal” effort, and Graham-Cassidy. Cost control in the health system has been so unexpectedly effective that the government is now projected to spend less on health care with Obamacare than we were projected to spend without Obamacare. I’ve written before about why the cost controls, particularly the Medicaid reimbusement rate, are problematic for access to care. But even difficult to access care is better than no care. During the fight to save the ACA, it seemed like a good problem to have. And it’s amazing to read that Obamacare has fulfilled the ideal that making care accessible can reduce overall health care costs for the entire country, even when you are subsidizing premium costs. Yet now that the ACA is safe for the moment, we should use this brief period of time to start thinking about how to address the issue of health care inequality. I know of two instances where Medicaid controls cost at the expense of quality. 2. Home care, such as home health aides, and even some therapists such as speech therapists who see patients in their home, can be limited by Medicaid service payment rates. 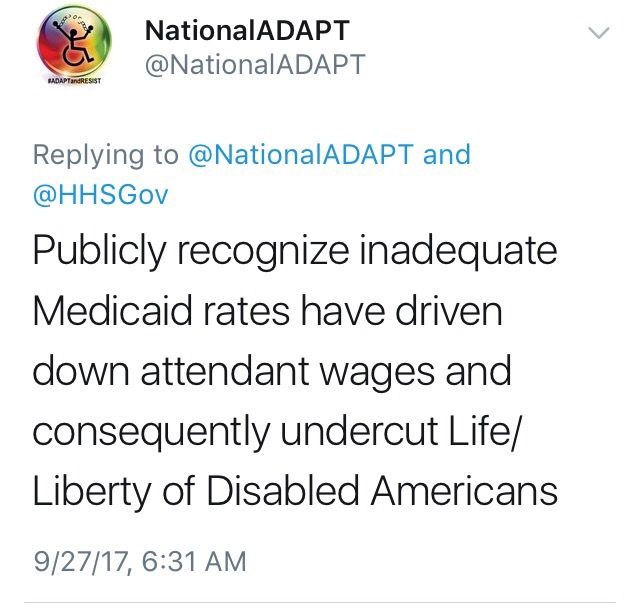 Just this morning, I saw this tweet, from @NationalADAPT to HHS. I’ve seen this in my community as well. My local regional center, which are the local government agencies in my state that coordinate support services for adults and children with intellectual disabilities, now face impediments because of an increase in the minimum wage. By law, they are limited in what they can pay, and that rate is now below minimum wage. And most regional center clients are on Medicaid. In terms of therapists, there is precedent for cutting costs now when it clearly will increase costs later. Texas did it in 2015, on purpose, and to disastrous effects. Last week I wrote a post about ABA where I shared that there were only two speech therapists in my area covered by my ACA, de facto Medicaid, plan. Now I’m not advocating paying more than prevailing rates. But when the law sets wage rates so low that an increase in the minimum wage makes payment impossible, that’s a problem. When you set reimbursement rates for health care providers at well below the fair rate for all other health insurance plans, that’s a problem. And when you set rates so low that organizations providing services to disabled kids on Medicaid go out of business, that’s a problem. This is a lack of basic health care equality. And while it may sound like a nice-to-have, it’s more than just a minor issue for the millions on Medicaid who can’t access care that they need. I do believe our health care system needs to address affordablity. But it shouldn’t happen on the backs of the most vulnerable in society, like disabled kids, who rely on Medicaid for care. While the ACA has made life considerably better for the millions who have gained access to care, Medicaid is still the lower of a two-tier health care system. And now that millions more have access through the ACA, this problem is growing. For well over 15 years, I’ve closely followed health care policy. Occasionally there is lip service to making Medicaid equal to other health care options, but rarely are improvements made. If you Google the subject, you will find a lot of studies advocating an increased number of people on Medicaid to increase overall access to care. I support universal coverage and agree this is a good way to do it. But who among those advocating this is actually using Medicaid and seeing these issues? The Republicans control Congress and the White House. They’ve shown time and again this year that they want to cut costs and don’t care who they hurt or even kill to make it happen. But one day soon, Democrats will have another opportunity to pass legislation that matters. And when that day comes, we need to be ready. We can’t pull a 2017 GOP and fail to plan. While we are dreaming big for Medicare-For-All, let’s recognize that for the 60 million Americans on Medicaid, health care access and availability is still less than ideal. It’s less than the crappy, bare bones HMO plan that many of us would feel lucky to get at our job. It’s less than the EPO offered at an employer with “good health insurance”. It’s less than Medicare. In fact, it is the Walmart plan. Many Walmart workers are on Medicaid, because Walmart doesn’t provide health insurance to most employees, and many Walmart workers make so little that they qualify for Medicaid. I know many on the left are energized by the idea of Medicare-For-All. I am too. But we have to be realistic that it’s going to be a hard sell for even a solidly Democratic House and Senate, because it will cause an enormous, probably at least five digit, number of job losses in health care. I know there are many reasons that shouldn’t be the case, and maybe it wouldn’t, but let’s be realistic that insurance companies will lobby hard against Medicare-For-All. But let’s say we get to the point of debating how to pay for it. The quickest way to get there is with cost controls like a reduction in reimbursements. A reduction in reimbursements will make the American Medical Association lobby against it. And they were the organization that needed to be bought off for Medicare in 1965. To appease the AMA, physician payment was based on a local calculation of a “customary, prevailing and reasonable” fee. However, doctors did not have to accept Medicare’s fee as payment in full (i.e., “take assignment”) for any individual patient. With professional self-control the only control, the rate of increase in doctors’ fees doubled. It’s possible that the AMA could potentially help with reimbursement rates if they advocated for Medicaid. But it’s unclear that they would be able to get a permanent fair reimbursement rate and also have all Medicaid users moved into Medicare coverage. It would increase costs so significantly that the argument for it’s cheaper to cover everyone, while probably still accurate in the long run, harder to make for the 10-20 years while costs soar. And once they start talking cost controls, Medicare would surely face at least some of the same problems as Medicaid faces right now. So if we can’t get Medicare-For-All, as envisioned now or at all, we have to prioritize improving Medicaid payments. It may never be as good as the top of the line PPO, but it can be better for those who need access to quality, reliable health care the most. For more information on inequality in Medicaid, I suggest looking up @NationalADAPT on Twitter.